Whether you have bins of fabric scraps or just a few odds and ends that you can’t part with, Lynn Harris, Nancy’s guest on this episode of Sewing With Nancy, will share refreshing ways to incorporate scraps in quilt designs. Learn to use fabric pieces of every size, from tiny scraps to larger pieces, during the featured program, Every Last Piece. In our featured Sewing With Nancy TV show, Every Last Piece, Lynn shares her “string piecing” methods for creating beautiful scrappy quilts. If your scrap bin is like Lynn’s, it’s overflowing with scraps of all sizes and shapes. The square blocks in Lynn’s Window Garden quilt are made with “strings” of fabric. The secondary pattern is created with the addition of Hourglass blocks. This is a great way to make a bigger quilt from fewer string-pieced blocks. Lynn will demonstrate the basic techniques of how to create string-based designs on this episode. Start by choosing larger scrap pieces that extend past your desired block size. Vary the angle of the seams for added interest. See how easy it is—on this episode of Sewing With Nancy. Now it’s time to take strip piecing to the next level. Instead of creating square blocks, stitch leftover pieces to a specific shape. Lynn’s quilt, Rose Lattice, creates great visual movement by cutting the blocks on point. It’s a relatively simple way of creating a free-form block that really makes a statement. 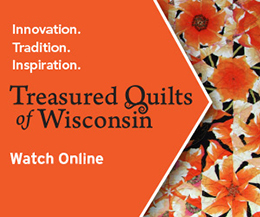 See the quilt on this episode of Sewing With Nancy. Large pieces of a Paris map fabric inspired the name of this quilt, Paris on a Shoestring. Lynn played around with string triangles that she made ahead, and then laid out the blocks in a star design. What a great way of combining pieces with yardage! No matter what size or shape, use those treasured scraps to fit any template shape. Solar Flare, Lynn’s next string quilt, combines triangles of scraps and other triangles of solid fabric. A layout suggested by her son, has both drama and style. Lynn’s Beach Balls quilt is an exercise in a controlled use of color. The design features monochromatic string-pieced squares in the background and brightly colored beach balls made of wedges. The best part—the design was totally created from her scrap bin. Watch how Lynn demonstrates working with this traditional Drunkard’s Path design on Sewing With Nancy on Every Last Piece. When your scrap box is dwindling down, it’s time to make stars! Lynn worked on making stars for several months until she had accumulated several hundred! Yes, several hundred patches. Then, she laid them out into 9-patch units. Work in small batches, and soon, you too will have enough stars to make a small or even a bed-sized quilt named Stardust. Watch Every Last Piece on Sewing With Nancy online. 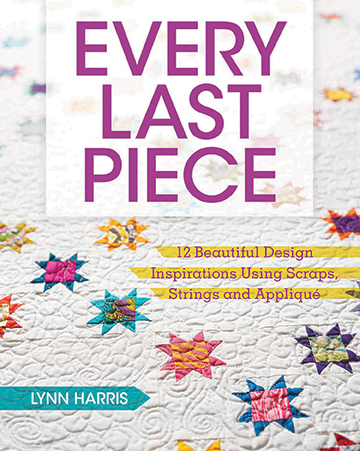 For a chance to win a copy of Every Last Piece by Lynn Harris from F+W Media, please leave a comment sharing which quilt (above) you would like to make. 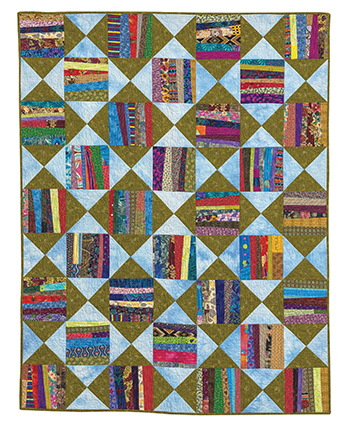 The winner of a copy of Magic Inch Quilts from Modern Quilts Studio is Pamela A McPherson. Her comment is: I don’t throw any scraps away and reuse them on a variety of sewing designs/projects. The smallest is 1/2″ x 1/4″ – they can be used as ‘tools’ for any sewing project, i.e. reinforcing elastic used in waistbands. The latter use was a tip I learned on Sewing with Nancy! Content in this feed is © copyright 2018 by Nancy Zieman Productions, LLC and may not be republished without written permission. You’re welcome to forward the email to a friend or colleague but it’s not okay to add the RSS feed automatically as content on a blog or other website. The FTC requires us to tell you that Nancy Zieman Productions, LLC has provided products by other companies in the course of doing business. The FTC requires us to advise you to take this information into consideration when reading this posting. Make sure you are subscribed to Nancy Zieman Productions, LLC enews mailing list so you won’t miss a thing. Sign up here. Join us on Facebook, plus a host of other social media channels. Connect With Nancy and Friends today! I plan to make the Beach Balls scrappy quilt. When I first saw “Every Last Piece”, I got others to start saving their scraps for me. I’m determined to make the stardust quilt. That episode and “Magic Inch Quilts”, are my favorite shows, although I love them all because Nancy has taught me so much. The Stardust quilt makes such an impact. This quilt could be very plain with all the white dead space, if not for those charming little stars. Bravo. The arise Lattice is so beautiful that I would love to use up some of my stash scraps to complete it. I have never made a quilt from scraps like my Mom did when I was growing up and I would like to make it in her memory and it would become the Venice Lattice Rose in honor of her. I loved Paris on a Shoestring! Then, I would do the Solar Flare. Some really cute quilts in this book! I’ve recently just started saving my scrapes which I should have been doing all along, shame on me! I’d do the Paris on a shoestring, then solar flare changing the yellow to strings done in yellow scrapes. I think I would like to make the one with tiny stars! I would like to make the Paris on a Shoestring. I would like to make the Wind Farm Block quilt. It is very eye-catching and unique to me. The possibilities are endless depending on the fabric choices. I love the Starburst quilt! It is so beautiful. It is Simplicity with elegance! Window garden inspires me to keep up with managing my scraps! I would make the beach ball quilt with scraps left over from the play sets I make for my great nieces and nephews.The children enjoy the beach and use an old quilt as a beach blanket. A new quilt with familiar fabric from the shorts and tops would make them happy. I have quite a collection of strings, scraps and larger pieces of fabric — the Rose Lattice quilt appeals to me and looks like it “might” put a dent in those collections. I just love the making stars from scraps. I also love the string quilts. I find it difficult to decide which one I would make first – Making Stars or Beach Balls. I just want to make them all! I love using all my scraps for wonderful quilts such are shown in this book which I have been trying to find for a longtime. I’ve made a lot of scrappy quilts but beach balls really caught my eye. What an interesting book! I like using all my fabric scraps and would love to make the Rose Lattice quilt. Cutting the blocks on point creates a visually stunning quilt. The star quilt! I love the idea of collecting them for a long time from the scraps of quilts I have made and having a quilt to remember all the quilts I have made. This episode has so many great ideas! My favorite quilt is Paris on a shoestring. Lynn certainly doesn’t waste any fabric! I would Love to make the “Paris on a Shoestring” quilt. I think it sets off the string blocks the best. I’m thinking of making Wind Farm as a graduate gift! I am a big fan of Lone Star type quilts so Solar Flare would be my first choice. I would love to make the Solar Flare quilt. I need to start saving more scraps! These are amazing. I want to try the Making Stars quilt! I love it! I love the stars cover quilt. I love scraps! I really like all of them, however, I think the stars would be great because then I could do some machine quilting on the open spaces. I just love the solar flare! The wind farm quilt would be my choice. I’d love to make Paris on a shoestring. I absolutely love string quilts. I’m making one now out of scraps from quilts and bags that I have made for family and friends. I’d love to use every last scrap to make the solar burst quilt. Rose lattice. I have plenty of scraps for a couple of quilts. Like the look of the block positioning. I have always loved scrappy quilts. All of the quilts above are great but I think I would like to make the Stardust quilt. I would want to make a full sized one and I can see myself snuggled up under it with a good book, all warm and cozy. I would really like to make Solar Flare, but all are really nice. I have a LOT of scraps; so I could eventually use all of the patterns. Hard to pick, but I think I’d start with the Beach Balls quilt. I would love to make the Wind Farm quilt as I did not see the spinning wheels until I really looked–that is a neat effect!!! I would love to make that beautiful Stardust quilt! In fact, I think I will get off the computer, and start sorting my scraps right now! Hope I win the book! I love the Paris on a Shoestring quilt. The background fabric makes the multi-colored fabric pop. I have a big box of my Grandmother’s retro scraps that would be perfect. Would be a great memory quilt. “Beach Balls” would be the first quilt I would make from this group. Although “Stardust” is also an eye catcher. I have two large bags of scraps that I’ve been savings. Now I know what I was saving them for. Can’t wait to try this. So glad I have been saving my scraps. I would love to make a Wind Farm quilt. I love the little stars. I enjoy making things out of what others see as just scraps. I just finished a quilt made out of old clothing my mom had saved. Everything from maternity clothes she wore with me( I’m 61! ), my grade school dresses , and things we made together. I see a stardust quilt in my future! I loved the wind farm quilt and the beach balls. Amazing what you can do with so little! My fabric scraps are my “treasures” or so it might seem. I see endless possibilities as was illustrated in a “Wonky Stars” quilt that I made several years ago and was what welcomed our adopted grandson into our family. He claimed it got “holes” in it as his little legs grew so rapidly and it no longer covered his toes. So another quilt was made. Oh, the joy! I love the look of the little stars quilt and I have lots of scraps to use up! When I quilt I like to use up my scraps. Right now I have been sewing up strips of fabric. This has given me some new ideas on how to put them together! The book would be very helpful. I enjoy all your shows. Thanks! “Oh, Oh” I need this book ! My scraps are in desperate need of a forever home !! This book is such a great idea, waste nothing !! Thank You for the opportunity ! All the quilts are lovely, but I think the Beach balls are fun. I would add either a few more or maybe a net. I save every last scrap and I think the Wind Farm Block quilt is very striking – I love the sense of motion. Tiny (2″) star blocks in a full-size quilt is one I’d like to try to make! I love the windfarm quilt. I like the star quilt. I have been wanting to make one and with this incentive oi using my scraps it seems even more likely. It’s a toss up between solar flare and wind farm for me. Love this style. I love Solar Flare – the solids (or semi-solids) get a chance to do something different. But I also love Stardust… I wonder if tiny stars could play in the background of Solar Flare?!?!?! Hmmm…..
Paris on a shoestring looks like a great way to use the scraps that I just saved, just in case. Thanks for the wonderful giveaway. Every Last Piece is not only a fantastic title but truly the quilt honors every word!!! Outstanding. Would like to try to create the Solar Flare quilt as it makes quite a visual impact and could imagine it hanging on a wall in my home. I would make Paris on a Shoestring, thanks. I’d make Stardust. Not only would I enjoy the quilt, I’d be listening to the song while quilting………. I would love to make the beach ball quilt. I think that is just stunning and a great use for my stash of bits and pieces. I’ve made a similar “rose lattice” quilt top; but would love to have patterns for the “solar flare”, “stars” and “windmill”…wow! how dynamic those could be! I have so many bins with scraps according to size. I could make them all and probably still have scraps. I think they are all awesome. It would be very difficult to pick one. I think I would like to try window garden or solar flare although all of the options are beautiful and appear to be a great way to use up those scraps! Thanks for the opportunity to win this wonderful book. It is hard to choose just one; I probably have enough scraps collected to do several. I would start with Rose Lattice, then maybe Beach Balls (I like the circles combined with the squares) or Solar Flare. The options are wonderful. I have a lot of scraps so I would love to make the String Quilting Shapes because I 3-D look of it. All the quilts are so pretty and clever!! I think the Beach Ball quilt would be unique, and it makes me think of my grandson and the fact he likes any game with balls involved!! Window Garden Quilt would be the first quilt I would chose to make. Yet, every one of the quilts are fabulous and would be so fun to create with all of my scraps! I have a lot of LOVED scraps and they would look great on the “Paris on a string”. The Stardust quilt is beautiful–also would like to try some of the more string pieced ones–This looks like a great book! I guess it’s the southern California girl in me, but I love both the Solar Flare and Beach Balls patterns. Either one would be great fun to make. All the quilts are lovely. I like the Rose Lattice. Visual affects with the colors looks amazing. I’d have to look over all the various quilts to decide which one to make. Rose Lattice looks interesting. Paris on a Shoestring and Stardust because I love stars. I just used up all my 2″ scraps but have three plus drawers of strings and other size scraps. For some reason the scraps grow faster than the quilts I finish! Paris On Shoestring because my 15 year old granddaughter loves everything Paris and hopes one day to visit!! I love Stardust. all those little stars are just to cute. I marvel at anyone who has the patience to make them. I need to try a scrap quilt as my scraps will soon need a room of their own. I would enjoy this book because it would help me know what to do with all my scraps. My favorite is the windfarm block quilt. I would love to make the Rose Lattice. I have a drawer full of scraps that I would love to use up. I like the idea of using the scraps in a meaningful way and by doing so I can reflect upon the projects and gifts that were made from each scrap. So many beautiful quilts! My favorite of the lot has to be the Stardust pattern; I see it as a lovely Irish Chain with added sparkle. I would love to make the beach balls quilt. I have so many pale background pieces with a few of the brighter colors and that translates well into the beach balls! Thanks for the give away. “Stardust” is really beautiful. It would be first on my list followed by all of the others. All of these quilts are beautiful. I especially like the Stardust quilt and would make it first followed by the Paris on a Shoestring quilt. I would love to make the Wind Farm quilt. Wind Farm Quilt block is the one I would make. I am always amazed at what you can do with color, even scraps. While they are all interesting and I truly love the movement in each, Stardust would be my choice for my granddaughter’s quilt. I would love LOVE to make the STARDUST quilt it is stunning! I love the Rose Lattice design! And the stars! I save everything, it’s not organized and ends up not being used. What an incentive this would be. I really would like to try all of them! My favorite is the Wind farm. We live in the country, and I work at a University where our power comes from wind turbines! It really reminds me of the outdoors and the gifts we are given. Thank you Lynn H. and Nancy! Oh, I am so fond of scrap quilts. They remind me of my grandmother’s work. I would LOVE to make Beach Balls!! Thanks for sharing. Paris on a shoestring is one I would try my luck with. I have many strings in my stash. I would love to make the Rose Lattice quilt. I love blocks set on point anyway and this string pieced block is all the more striking. I love scrappy quilts and the Solar Flare quilt would be the first one I want to make. How beautiful !! String quilting quilts is my favorite. Or maybe Beach Balls – nice contrast between background and bright beach balls. Bold and bright fabrics appeal to me the most. Scrap quilts are my favorite. I’m always on the look-out for different patterns. Love Scrappy Stars! Those are fascinating ideas. Love scrappy quilts. I would love to make Paris on a shoestring. It is beautiful. I have already made two string quilts. Need to use up my scraps. Love these ideas for using scraps – I’d probably start with the Beach Balls quilt since I love the Drunkard’s Path pattern and love sewing curves! I would like to make the solar flare quilt although I have enough scraps to make them all. Stardust is my favorite as love stars but also love to do string piecing. I head up a quilt group at our church and the strip piecing projects are perfect for us using up scraps!! The Stardust quilt pattern appeals to me and the name is so fitting. Would love to make the Paris on a shoestring. My daughter loves Paris and someday wants to go. Would love to make this for her birthday. I like the Paris on a Shoestring quilt. What a clever name! I’ve been saving my string scraps for a future quilt. I love windmills. They seem so “other-worldly” to me So I would love to make the wind farm quilt. I love scrappy quilts. I would make the string quilting shapes. I Love, Love, Love the Rose Lattice quilt, Ive been saving my scraps and now I know what I will be making with them! Thank you so much Lynn Harris for sharing your ideas. I would like to make the Rose Lattice quilt. I love the blocks on point. Boy it’s a tough choice between Beach Balls and Stardust but I like the idea if making little stars here and there until you have enough. It’s like working on a quilt without the feeling it needs to be completed. Great idea. I like most of these but Beach Balls is amazing. I would make Stardust because I love all quilts with stars! It would be impossible to pick one. I like them all! I have made a few string quilts over the years but there are possibilities in this book that I didn’t think of. I can’t decide whether I would like to make String Quilting Shapes or Beach Balls Quilt. All the scrap quilts are so attractive. WOW you are going to make this scrap crazy girl choose? OK, I’d start with STARDUST! Love all these ideas using scrap pieces from my stash. Now I can make something beside pot holders with my small pieces of fabric. My guild has a half-square triangle challenge this year, so I would choose Paris on a Shoestring, converting the squares to hst”s to complete the challenge. The scrap quilts are simply stunning! I think I would start with the Rose Lattice. I like Paris on a Shoestring. Great way to use leftover scraps. Oh this looks great! I’d probably begin with Solar Flare or Stardust. I love the Rose Lattice quilt. I know I have enough scraps to make every quilt in the book and then some! I would love to make the string piecing shapes quilt! Now that I see all these possibilities, I’m so glad I didn’t toss out all those small pieces. These are great ideas for leftover fabrics! Would love to make the windfarm quilt. While I love all the ideas, I would make the windfarm quilt. It is so unique.